Construction has resumed on the controversial site, 40-31 82nd Street, in Jackson Heights after a Hail Mary attempt by an anti-gentrification group, Queens Neighborhoods United, to prevent the building’s main tenant, Target, from entering the neighborhood. Members of Queens Neighborhoods United filed a zoning challenge to the city’s Department of Buildings in late August. The challenge stated the developers, SunEquity Partners and The Heskel Group, were building a commercial store that was too large for the area. “When we heard about the development on 82nd, it was already in the later stages and we knew we needed to jump into it,” said Queens Neighborhoods United member Josselyn Atahualpa. The Department of Buildings, or DOB, issued a Stop Work Order in late August in response to the challenge. Senior Deputy Press Secretary Andrew Rudansky explained they found a violation under Use Group Six, which states a retail store in the neighborhood must remain under 10,000 square feet. He said the original plans called for a store nearly five times that size. “The developer was told that if they wanted to proceed with the project, they would need to revise their plans to satisfy the objections noted in the accepted challenge, and return to the DOB with the revised plans for review,” Rudansky said. Yeheskel Elias, CEO of The Heskel Group, says they were not purposefully trying to violate the rules. “We went through Hell. We gave them all the answers they needed. The city is in agreement and they re-certified it,” Elias said. The Stop Work Order was lifted On September 17. According to the revised building plan, the floor plans changed from one commercial store to five small stores, each under the regulation size; however, Target spokesperson Jacqueline DeBuse confirmed this store will remain approximately 22,700 feet. 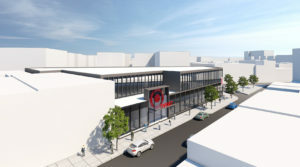 “This store will be designed similarly to several other New York City Target stores, offering shopping in both the ground level and lower level to meet the area’s zoning requirements. The flexibility of our small-format design allows us to adapt the layout of those stores to best meet the needs of local guests while also fitting into an existing space,” she said. A visual representation of the two-story building. “Who takes up occupancy as a commercial tenant in those stores is not a regulation the Department of Buildings enforces. Hypothetically, it could be a situation where that particular business would take two or more of those original storefronts,” Rudansky said. Inline Reality, the real estate brokerage firm for the development, declined to comment or clarify which stores will fill the spaces. DeBuse confirmed this Target will offer a variety of household items, child toys and sporting goods, as well as a CVS Pharmacy. Atahualpa says people can already purchase all of those items from small businesses in the area. Despite the fears raised by Atahualpa, some local businesses owners in the area are not as concerned. Western Drugs Pharmacist Muhammad Asghar says the neighborhood is tight knit, so he has no worries of losing customers to the pharmacy within Target. Atahualpa believes that while the new addition is exciting for some, the feelings may fade. For many New Yorkers, the rising rents that come with gentrification is a legitimate fear. As of 2016, 36% of renters in Jackson Heights were spending half of their household income on rent, which is about $1,875, according to a study by the Furman Center. For Atahualpa, pushing back against any big city chain store is part of keeping the neighborhood affordable. Elias says he has done business in Jackson Heights for forty years, and firmly believes the development can enhance the neighborhood without pricing people out.